Ramblings of a multi-tasker: I'm still alive and still running! I'm still alive and still running! In case you wondered, I am actually still breathing. As you may have guessed and if you follow me on Twitter you probably know that the feeling a little ropey, as documented in my last posts, escalated into full blown influenza. Not the kind of ‘I’m feeling a bit fluey’ flu but the ‘I cannot even move from my bed ‘flu. People use the term flu way too frequently when they should just be telling you that they have a cold. I didn’t even have a hint of a sniffly nose but I did have a fever for five days, couldn’t move and was even seeing dogs in my room in the night. We don’t even own a dog. I think this was a little bit of hallucinating due to the fever. I am a stubborn madam and I wasn’t going to let anything get in the way of me and Janathon. I meant serious business when I signed up but this virus well and truly ruined that plan. The day after my last post (Janathon day 25 and my 27th consecutive day of exercise), I dragged myself into work to finish a few urgent bits then crawled back to bed which was where I stayed for over a week. I can’t quite believe how bad I felt and then developed a chest infection too. I still have a gross cough but you’ll be pleased to know my training is back on track. I was so anxious about my training. The training plan didn’t schedule for illness on this scale. As soon as I was feeling a little better I was back out there with my running shoes on. After nearly a two week break I was really nervous. It just happened to be that on that Saturday morning I’d slicked on some red lippie for some extra va-va voom. There was nothing for it. I decided to keep it on for my run. Not only is it a complete pain to remove without leaving a ‘I’ve been drinking cherryade out of a bottle’ look but it also has a special effect of giving you an extra confidence boost. Wearing red lipstick screams the message “Don’t mess with me!” and I wanted to tell this run that I meant business. 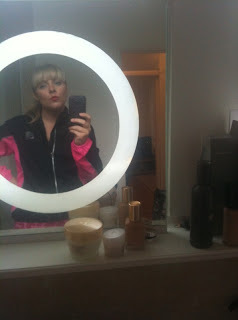 I got a few funny looks as I jogged on by with my clashing black and pink running jacket but I didn’t care. Even though I was still a little wheezy I really enjoyed the run and loved being out there. It was only a short one but I didn’t want to go mad. That all changed on the Sunday. I headed out aiming for 13 miles. I was feeling good and needed to prove to myself that I was capable of running the half marathon distance, even if it was slowly. I did it and I loved it and completed it in 2 hours 20 minutes. I was absolutely over the moon! I’m no athlete but I still can’t quite believe that I managed it. I kept checking the route that I’d mapped just to make sure I hadn’t cheated and sure enough I hadn’t.